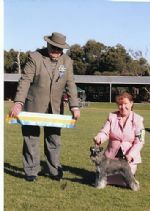 main photo Gabbie winning Minor Puppy IN Show,May 2009. Gabbie( Besten She Can Rave) is a daughter of Koobalies U Talkn To Me( Brag) and Grand Champion Besten She's So Vain(Vanity). 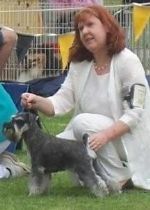 Gabbie has captured that eye of many judges and she is a delight to show and own. It has been commented that she is seen as a younger verison of Vanity " Grand Champion Besten Shes So Vain"as she powers around the ring. Vanity with bubs and Gabbie under her mum's arm.